Ghost Blind Runner - How Does It Work? MIRRORS Reflective panels mirror the earths floor and natural surroundings. 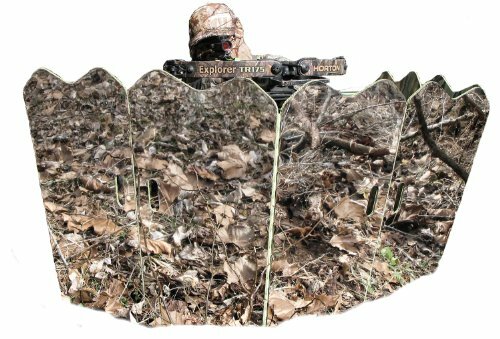 It's Like Having Thousands of Camo Patterns in One Blind Design Eliminates Any Unwanted Sun Reflections & Animal Movement Ghost Blind's design reflects the sun down to the ground. For the hunter on the move who likes to sit directly on the ground. Great for turkeys, deer or predators with a gun or cross bow. At only 8 lbs, the Runner makes for easy carry and quick re-location. Carry with carry strap or most hunting vests. Quickly stake down blind with tent stakes. Constructed with weather resistant polypropylene panels. Dimensions: 98”W x 26”H Only 26” x 16.5” when folded. Perfect for pre-season scouting. 6 reflective mirror panels. U.S. & Foreign Patents Pending. Ghost Blind Runner Includes: Blind, 2” carry strap, 4 tent stakes, 1 bungee cord & instructions.